"The Novation Peak is an eight-voice desktop polyphonic synthesizer with a hybrid analog/digital architecture. It features three New Oxford Oscillators per voice, a resonant multi-mode analog filter for each voice, and three distortion points in its analog signal chain." Definitely didn't see that coming. Sounds pretty good, and that filter in hi-pass mode sounds awesome. I just got a mailshot from Novation about this. Happy to see two LFOs. Always made me scratch my head why a lot of hardware synths only had one LFO (I'm looking at you, System 8). Could be my lack of knowledge of what is out there, but it's a big reason I went modular. Facilities and sound quality all seem good at this point. Hardly surprising with Chris Hugget (Oscar/Wasp) involved with the design. Funnily enough, just hours before stumbling on this, I was thinking how nice it would be if an affordable, enhanced to current standards, Korg EX8000 /DW8000 concept was out there. This hybrid fits very nicely into that projection. Like the way they've sneaked a freely assignable CV input on the rear panel. Agreed. It's nice to see artists like this and other people from the "high art" world e.g Max Richter start to endorse products. Good to show people that synths can do more than just trigger women to gyrate wildly. This certainly has my attention. It's the year of the hybrid synths I guess (this and the new Waldorf synth). I have a Parva coming, and I'm still watching this. Regarding two LFOs... yes it's nice. I would have hoped for more, although with three oscillators you could probably work around it. I've been spoiled by DSI with four LFOs and 3 or 4 envelopes. I'm particularly glad this has a third envelope at least. An option for a looping envelope would be nice, but not a deal breaker. All in all, I'm glad to see more companies offering reasonably priced polysynths. I'm not sure if I'll actually take the plunge. But I'll certainly be watching with interest. 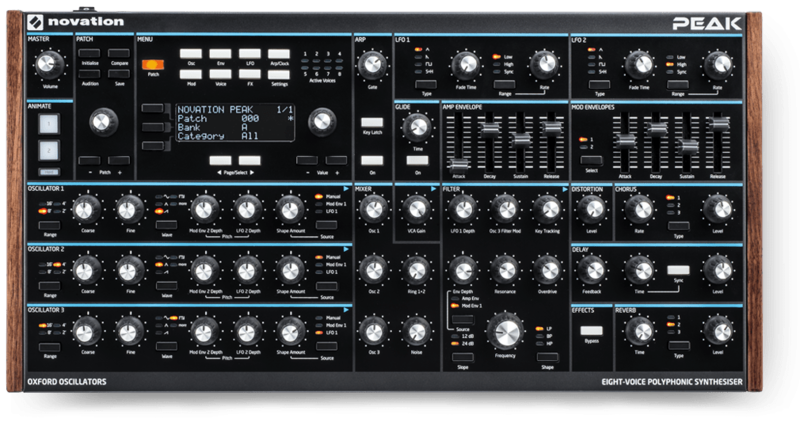 I personally thought the Bass Station II is an excellent value, and a wonderful sounding synth. This seems like the logical progression. as long as I know FPGA is pure analog, so why they says that the oscillatoras are digital? Oscillators are totally digital unless I read something wrong. Looks nice, but don't know why they had to dedicate so much panel space for digital effects. Would've been better to have a few mix and parameter knobs and then more accesss via menu. Would've much rather had 4 more sliders for that 3rd envelope instead of toggling. "but Peak uses a new Numerically-Controlled Oscillator (NCO) design that combines analog sound with the flexibility of digital wavetables." Is this the first FPGA-based synth? Pretty interesting stuff. I'd love to put the oscillators in this up against a real analog synth and see how close it gets - I bet it's very very close indeed. Also of interest: audio-rate modulation, a healthy mod matrix, pre- and post-filter distortion, and an analog dry path through the effects. I don't like the knobs, and I wish it had analog clock in and out, but otherwise this is looking pretty impressive. It says something about the synth market that Novation feels the need to go to such lengths to avoid saying outright that the oscillators are digital. The closest they really get is describing the DACs they're using for each voice. Some people will not realize that means the oscillators are digital. Any digital control requires a DAC. There are DACs for patch memory, for instance. My understanding of NCOs is that they rapidly calculate data and then send CV to control circuits to generate that data in the analog domain. So while the waves are entirely generated digitally (this method allows for wavetables to be generated by calculating the shape of the wavetable), it is controlling analog circuits to shape the waves. This is entirely different from an audio rate digital signal being sent from a DAC to the filter stage. Describing the DACs and sample rate are showing the rate of calculation for this CV data for the analog circuits. It is still ultimately digital information, rather than purely electric signals, but a large step away from DSP-modeled waves and the sounds in the demos are clearly apparent of that difference. So yes, in a way it is analog sound. In the Modal 002 the NCOs do not have any digital conversion for audio path and lie in the analog domain from NCO to output. Also in the Modal 002 the NCOs are not phase locked, so they are all swimmy and constantly contrasting each other like VCOs would. If Novation implements this style of design for cheaper than Modal, absolute game changer. That one looks really good (and sounds better). Honestly I don't care if the OSCs are digital or analog. In fact I'm sure the digital OSCs would fit my studio setup better since they are a lot more versatile. This gives me vibes of the Roland JP-8080 in appearance, which was a classic. The design is very clean looking. Me too. I can't stand having only 1 LFO actually. I like the design, nice clear layout (not too small! ), no keyboard, the angled stand (somebody should make this for other synths, I see opportunity there) - and even the marketing. No stupid teaser or hype, just an interesting musician giving his honest opinion. I should check out Hauschka's work, what I heard in the demo was right up my alley. Now, will I buy it? Probably not, because in the end it's another digital synth wanting to be analog. I mean look at al the effort they've put into this thing, new oscillator designs, new chips, a lot of brand new code I presume, all for making perfect saws and squares? And don't get me started on reverb, yes it sounds lush and impressive but we've got great sounding reverb elsewhere (pedals, plugins, etc.). Waste of processing power in my opinion. I'm not against digital or hybrid designs, in fact I own a Microwave I which I absolutely love and still find new sounds in every day. I also have a CZ-101 which has a unique character to itself. What holds these early digital synths back is the interface, as you know it's no fun scrolling through parameters on a tiny lcd. That's why we see so many unashamedly digital modules in eurorack - the format (finally) makes digital fun to use and allows the user to explore new possibilities. Novation and all other synth manufacturers should take note. Give us "new" digital with an analog interface. Look at Braids, Loquelic Iteritas, Akemie's castle, etc. for inspiration and cook something of your own.